I got my email from Pink Chalk Fabrics and I was so excited to read about the new Kona colors–28 beauties! And three new shades of gray. My guild has the opportunity to exhibit quilts at Santa Fe College here in town and I’ve been mulling over some ideas. I am thinking about a sort of slice-and-dice / pick-up sticks style–with bold colors and lots of white. I haven’t abandoned the idea of entering a double wedding ring quilt in the NYC Metro Modern Quilt Guild challenge. How far away that December deadline seemed this summer! Hmm, I’m also thinking about applying to be a vendor at a craft show in December. I would need to make some small items like mini quilts, coasters, placemats. I know I can’t do all these projects but these lovely solids are inspiring! I can think of so many things to make! What are you thinking about making? This entry was posted in fabric, Modern Quilt Guild, quilts and tagged 2013 colors, Kona cotton, NYC Metro Modern, solid fabric on September 15, 2013 by brigitdermott. 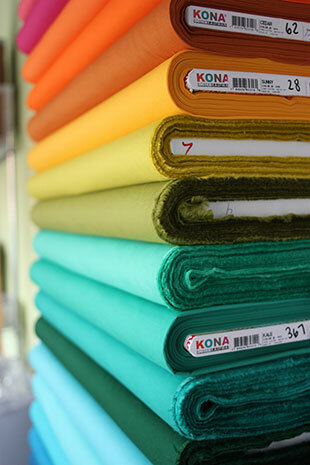 Kona Solids are available in a superb palette – but the new shades are just incredible. Looking forward to see your projects with this new collection! I know! I love the oranges and grays. I love your Christmas table runners, too. Really lovely work!